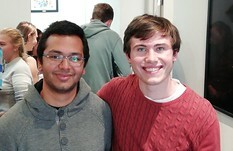 Jonathan Clark & Kripa Panchagnula have won the Under 26 Championship Pairs, which took place in London this weekend. They finished on +140 IMPs, with Ian Robson & Eshan Singhal in second on +118.2. Under-21 pair Sam Anoyrkatis & Elizabeth Gahan were third. The leading under-16 pair was Jamie Fegarty & Liam Fegarty who finished in ninth.